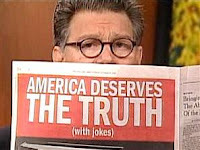 If and when Al Franken is elected to the US Senate from Minnesota, he should be sure to thank the kids. After all, without the inner city Boys & Girls Club funds that were shifted to Air America Radio's account, the liberal talk network would have shut down and Franken's big money- making days would have come to a quick end. The end result is that Stuart has entered the race with millions of dollars in the bank, some of which could easily be used to fund the campaign. Without Air America's cash, he would probably be broke. Al Franken, a comedian and best-selling author before launching his Senate campaign this year, is worth between 4.3 million and $9.9 million, according to a financial disclosure form he filed with the Senate. Franken, a Democrat who hopes to challenge Minnesota Sen. Norm Coleman next year, also listed a salary of just over $1 million last year from his corporation, Alan Franken Inc. That corporation is the business entity that provides Franken's services (such as speaking engagements and his prior service on Air America Radio), and then pays Franken a salary at the end of the year after commissions, taxes and other fees are paid, said his campaign spokesman, Andy Barr. The disclosure reports require figures to be reported only in broad ranges. But Barr said that Franken's net worth is closer to $4.3 million than $9.9 million. Even on the low end, that would easily eclipse Coleman, a Republican who listed only an IRA rollover valued at $564,000 in his assets. Coleman's report voluntarily provided the exact market value. Another candidate in the race, Democrat Mike Ciresi, received an extension to June 30 to file his personal financial disclosure report. Ciresi, a trial lawyer, poured nearly $5 million of his own money into a failed 2000 Senate race. He has said he doesn't plan to self-fund again this year, but hasn't ruled it out. Franken, a former "Saturday Night Live" writer and performer, will contribute $4,600 to his campaign, Barr said. "Contrary to what Sen. Coleman has said, the magnitude of Al Franken's money is such that he won't be self-funding this campaign," Barr said. Last year, in a fundraising letter, Coleman said there was nothing funny about Franken's "venomous 'Air America' liberal radio show, his high-powered and deep-pocketed Hollywood friends, his national network of Bush-Haters or the magnitude of his personal wealth." As for his self- funding capabilities, it really depends on how badly he wants the Senate seat. With at least some future income from books and television still a possibility, Franken may well go for broke. At the same time, Coleman's right: Hollywood will likely come through in a big way for the campaign. While he may have mostly received a free pass from the mainstream media over the Gloria Wise scandal, his opponents may not prove to be quite so charitable. If so, it will take a lot of money to overcome the truth about Al Franken's shady past. "Without Air America's cash, he would probably be broke." What an inane comment. Franken had penty of other income sources -- including best-selling books and high-paying speaking fees. Obviously he made good money from Air America, but this statement is empty hyberbole. Brian: Why don't you either remove that line, or prove it. Since Franken left, you haven't had much to say about AAR. Franken's gone. Get over it and cover radio. In other words, move on Maloney you stupid asshat. Maloney hasn't had much to say about AAR since the Green Piece brought Maloney's boy Bernstein on board. "Maloney hasn't had much to say about AAR since the Green Piece brought Maloney's boy Bernstein on board." Oh, and I see we're back to "36 Views of Al Franken's Head." Watch out, Hokusai! Franken had penty of other income sources -- including best-selling books and high-paying speaking fees. And if Al hadn't had the radio show, he wouldn't have gotten the 2nd book or the speaking fees. The radio show is the difference between Franken and A. Whitney Brown. "And if Al hadn't had the radio show, he wouldn't have gotten the 2nd book or the speaking fees." But, if you believe Franken's show was truly awful, wouldn't that have actually detracted from his reputation and discouraged publishers, hosts, etc.? Oh, that must explain the deplorable "Lionel Show." Listening to that guy is like hearing chalk squeak on a chalkboard. I should probably give him a chance, but I can't stand the Mr. Rogers feeling his voice gives to the whole show. It's like listening to Lou Costello. It's just infantilizing. Oh, and criticize Al Franken all you want, his show was intelligent and featured incredible guests. I'm not sure how I feel about Al Franken's politics (I'll give him money to beat the execrable Norm Coleman), but he put on an intelligent, urbane show. Even if that were true (it's not -- Franken had a multi-book deal prior to his radio show), it still doesn't mean that he would have been "broke," as Brian falsely writes. It is simply an unsupportable statement from a man whose hatred of Franken clouds his common sense. Brian: Where is your correction? Still not man enough to admit a mistake? it still doesn't mean that he would have been "broke," as Brian falsely writes. If by "falsely writes" you mean he never wrote it, okay. Show me where Maloney said Franken would have been "broke" without AAR. For those of you that didn't pass reading comprehension in the 3rd grade, the "go for broke" phrase in paragraph #13 refers to the Senate race, not Al's bank account. And just because someone publishes a book doesn't make it popular. Franken and his so-called nemesis O'Reilly both released a book within a day of each other. O'Reilly's currently ranks #1198. Franken is at #30,269 at less than half the price. In Franken's case "best-selling author" is just a bit of a misnomer. Brian wrote: "Without Air America's cash, he would probably be broke." Not clear enough for you? Franken's book -- and O'Reilly's -- spent several weeks on the NYT bestseller list. That qualifies it as a bestseller. Only a moron would believe that Franken gained his wealth from AAR, a place which was unable to pay him for almost a year. This story is close to defamation of character, as you accuse him of being part of an illegal money scam, which he had nothing to do with.